David Banmiller, Aloha Airlines president and CEO, said yesterday a new deal with United Airlines was forged by a longtime relationship between the two companies. Aloha Airlines and United Airlines announced a new partnership yesterday in which the larger carrier would become a minority equity partner in Aloha, with a seat on the isle firm's board of directors. Chicago-based United Airlines will now share flight codes with Aloha Airlines on all of its mainland-Hawaii and Japan-Hawaii flights. Both companies declined to disclose United's actual stake in Aloha. United also partners with Arizona-based Mesa Air Group, which is in a legal battle with Aloha over the startup of Mesa's low-fare interisland airline, go! Mesa shares codes on some United flights and operates commuter service as United Express. David Banmiller, Aloha's president and CEO, said the new deal is separate from the Aloha-Mesa legal dispute. Rather, he said, the deal represents the culmination of a longtime marketing partnership with United that goes back to the early 1990s. But he added that the agreement "sends a strong signal to the customers about the stability of Aloha." Chicago-based United Airlines said yesterday it has agreed to become a minority equity stakeholder of Aloha Airlines. Both companies declined to disclose the equity share. No money will change hands under the agreement, but United will get a seat on Aloha's board of directors. 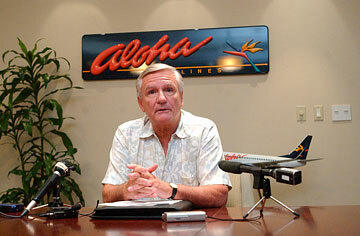 David A. Banmiller, Aloha's president and CEO, said the deal was forged by a longtime relationship. Aloha's marketing partnership with United goes back to the early 1990s. Both have done business in Hawaii for 60 years. "The beauty of this for Aloha is that we will benefit from the financial and worldwide marketing strength of one of the world's largest airlines," said Banmiller. "Both airlines have a proven record of providing quality air transportation to Hawaii's residents and visitors, who will reap the benefits as we work closely with United to market Hawaii's popularity as a global tourism destination and its links to Asia and the Pacific." The airlines' existing code-share agreement -- a common industry arrangement under which seats on the same flights are sold by both carriers -- will expand to include all Aloha and United nonstop flights between Hawaii and the mainland as well as Hawaii and Japan. Previously the carriers shared flight codes only for interisland flights. Banmiller said Aloha would also explore joint purchasing and facilities agreements with United. Los Angeles-based Yucaipa Cos., headed by billionaire grocery magnate Ronald Burkle, will continue to be Aloha's majority investor. Jean Medina, spokeswoman for United Airlines, said the new partnership will provide its customers with additional opportunities to earn mileage as well as seamless travel. On May 1, United celebrated its 60th anniversary serving Hawaii -- its inaugural flight was between San Francisco and Honolulu. Hawaii remains one of the top destinations for United's customers, she said. Frequent fliers entered in the AlohaPass and United Mileage Plus programs can continue to earn miles and redeem them for travel on either carrier. It is not, however, a financial investment, said Medina. UAL Corp., the parent of United Airlines, recently narrowed its first-quarter loss to $152 million from $306 million a year earlier. It emerged from bankruptcy in February. Local rival Hawaiian Airlines did not seem shaken by the new partnership. "It's hard to speculate about the exact scope of this agreement, since details aren't being shared," said Hawaiian Airlines spokesman Keoni Wagner, "but we're confident it won't change Hawaiian's position as Hawaii's leading carrier." A lawsuit that Aloha Airlines filed against newcomer Mesa Air Group Inc. -- which operates interisland airline go! -- is still making its way through the courts. Aloha accused Mesa of predatory pricing and is seeking unspecified damages as well as a permanent injunction to stop the newcomer from competing unfairly. Aloha also alleged that Mesa used confidential information obtained as a potential Aloha investor to enter the interisland market. Mesa offered to invest up to $25 million in Aloha in January, court documents indicated, but Aloha rejected the deal. Jonathan Ornstein, chairman and CEO of Mesa, declined to comment because United is one of its largest partners. Mesa has its own code-share agreement with United and also operates commuter flights as United Express. Banmiller said the agreement announced yesterday is completely separate from any legal proceedings. But he said this new partnership with United speaks volumes about the respect the companies have for one another. "We're making a statement to the world that we're going to be here a very long time and be competitive," said Banmiller. "It sends a strong signal to the customers about the stability of Aloha."